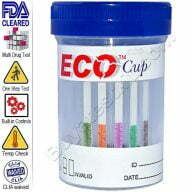 EliteScreen 5 panel drug test ECO2 is a second generation integrated drugs of abuse cup that detects five drugs simultaneously. It includes a specimen cup, a drug test, and a urine temperature check. These cups are FDA 510(k) cleared, CLIA waived and conform to accurate cut-off levels mandated by NIDA. 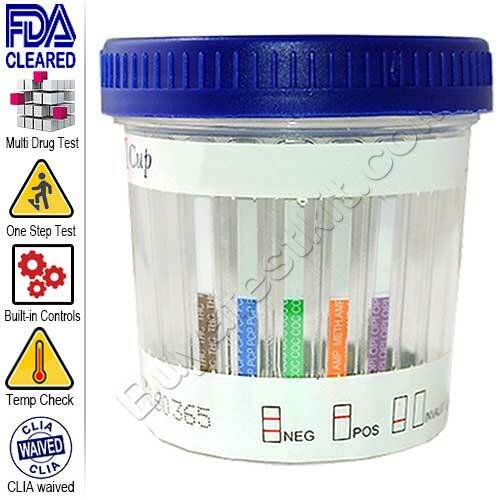 5 panel drug test features a wide-mouthed cup making it suitable for both genders. It includes a temperature sensitive strip for checking the donor’s urine temperature; an important part of every drug test is establishing the urine temperature is correct, so checking the temperature validates the urine is fresh and from the donor. Detects various combinations of drugs depending on the option selected: Amphetamines, Cocaine, Marijuana, Opiates, Benzodiazepines, Phencyclidine and Methamphetamine. 25 foil sealed tests per box. 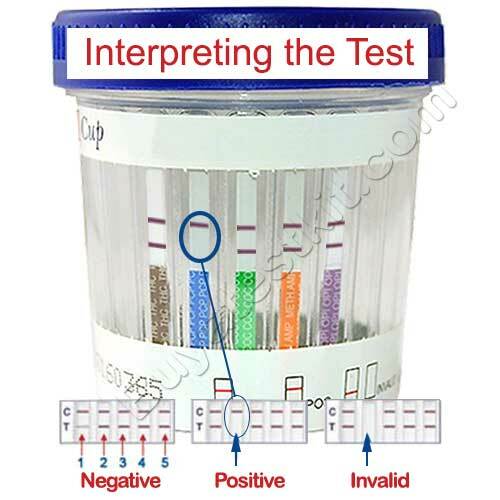 The testing process of testing is as simple as A, B, and C. Collect a urine sample in the cup to the marked level, secure the lid, read urine temperature, remove the label from the front of the cup and read the test result. Visible results can be seen in less than two minutes. From the image above it becomes apparent how easy it is to interpret the test result. After following the instructions and requesting the donor fill the cup with urine, remove the protective label to the front and observe the results. Each panel represents a tested drug; on this test, there are five. The top line on each panel is a control line (C), this indicates the test completed successfully. The apparent lines below are the test lines (T); these show the result, positive or negative. Negative: All (T) lines present. Positive: One or more (T) lines are missing. This cup is also available with a specimen validity test (ECOII-254W A/D) for checking the integrity of the donor’s urine. 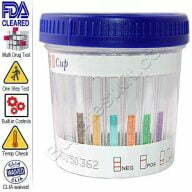 These features are important when it comes to drug testing as using fake or adulterated urine is a common practice. When using the optional specimen validity test, refer to the chart below and very carefully compare the color for oxidants (OX), Specific Gravity (S.G.) and pH level (pH). 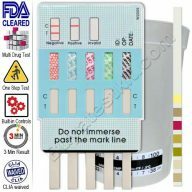 Establish that each color is within the normal range before reading the drug test result. The color chart to be used with ECO cups that include a specimen validity test. Full instructions for the 5 panel drug test ECO2 are included in the box. You can also use the links below for more information.